Two boxes full of goodness! Here is a REAL close-up! For those who guessed correctly, yes this close-up of the boxes that the transfer and the transmission came in would have revealed what was going on! Yes folks, it's the NISMO GETRAG Conversion Kit for the R32/R33 GT-Rs! Turns out, these Conversion Kits are "made to order" - so I had actually placed my order back in June but it wasn't until August that the parts were all ready to go. 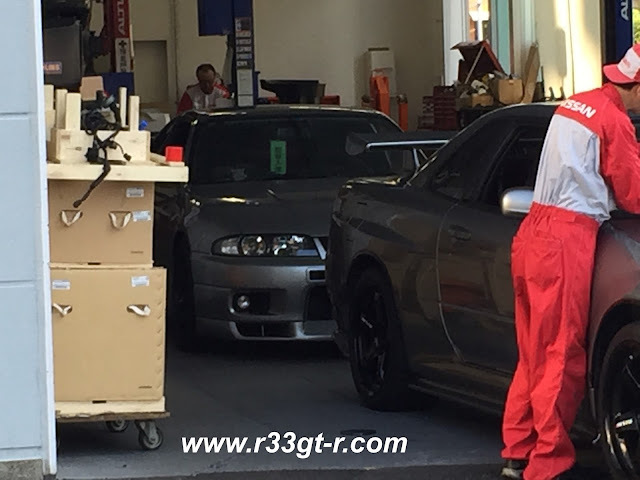 So really, this whole process started back when I did this post about NISMO's engine oil. You didn't really think I went to Nissan Prince for just an oil change, did you? Then, although the installation of the Kit itself only took a week, not only did a custom part for the Getrag take longer than expected (the Robson item below), I got lucky with the N1 bonnet, which required having the car in the paint shop for awhile, plus I was away for a couple of weeks, so from start to finish the car was at Nissan Prince for about a month. 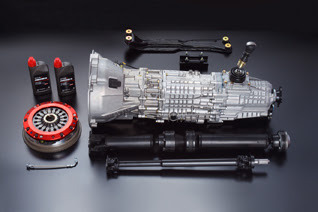 For those who want a refresher or just more information about the GETRAG kit, check out this link on NISMO's English website. 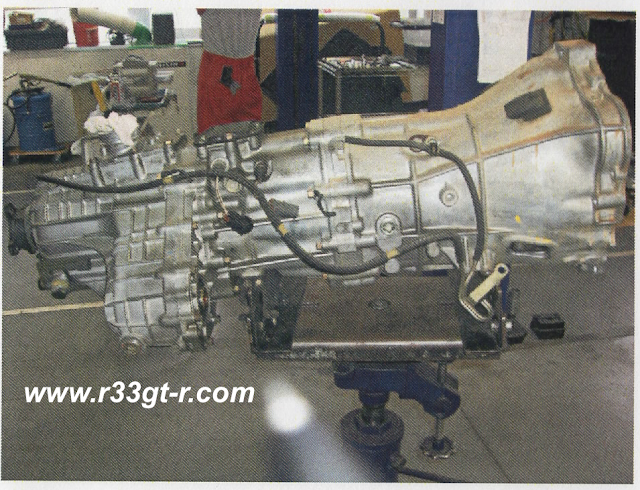 In addition to the transfer case and the transmission itself, the kit comes with a BNR34 front driveshaft, a "NISMO" r32/r33 rear drive shaft (somehow I doubt anything special was done to it), and BNR34 transmission mount and cross member. There are other bits and pieces too as explained in the NISMO link above. Call me weird but I don't like that GT-R logo there... wrong font for the BCNR33! Lastly - before I could get in the car and drive home, they had me sign an application Nissan is going to submit to the department of motor vehicles on my behalf- changing out the transmission is considered a major change to the car, so technically my car is no longer a "BCNR33" - it's now a "BCNR33改" (the character is read "kai" from 改造 (kaizo) meaning modified so it's a BCNR33-kai). The paperwork they submit demonstrates to the authorities that the gear ratio has changed but is still within x% of normal, only weighs y more kgs, doesn't change the overall dimensions of the car, etc. Ok so enough of the install - the all important question - HOW DOES IT DRIVE? Well, it's like being in 1/2 lower gear in the 5 speed, all the time. Acceleration of the car is instantaneous. Expected when the rear ratio is still 4.11:1. The engine is turning at above 2000 rpm at most speeds, meaning that that it picks up quickly, acceleration comes on much more quickly, but yes probably worse gas mileage and noisier on the expressway. Does it bother me? Honestly, yes a little. 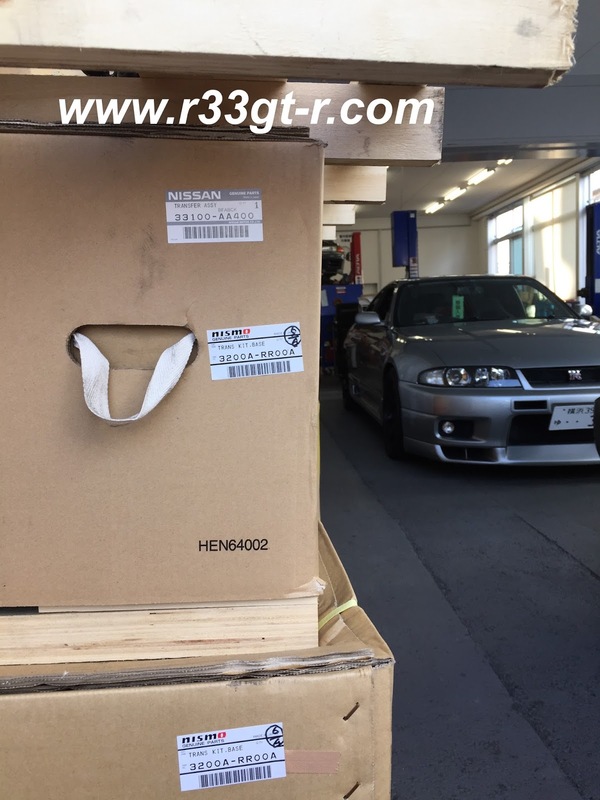 But I'm not about to spend another 450,000 yen for NISMO's 3.916 gear set, which if you look at the graph, really only changes things by about 500rpm or so. I guess to make it perfect, I would really only want to change 6th gear to be an overdrive to allow for relatively quiet and low rpm cruising on the expressway - right now it is a literal "point and shoot" weapon even in 6th, given how quickly the car accelerates. The other gearing is fine as is. In any case, I was told that I have to break this new transmission in - and that this would take about 1000kms. Given how little I drive my car, not sure how long that will take, but it DOES give me an excuse to take the car out more often. There are other small details that bother me too (in addition to the stitch color I mentioned above). 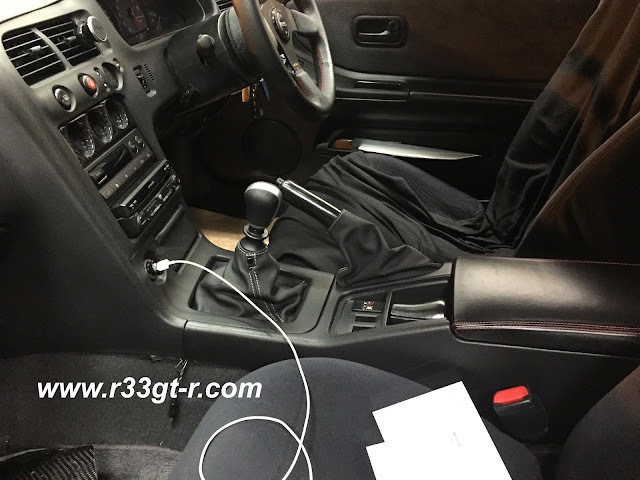 The gear shift itself is tall - remember for the OEM gearbox I had installed NISMO's solid shift gear shifter which is 7.5mm shorter in length and gives a more solid feel when shifting. Not sure who makes a short/solid shifter for the Getrag box but will have to see if I can find one. Anyway, the fun continues as I break in the gearbox and make the necessary improvements! Just WOW! 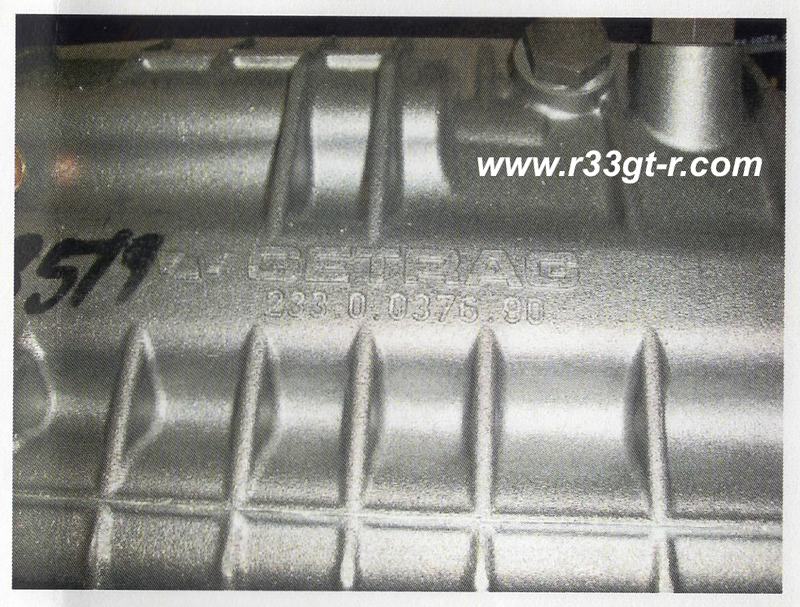 I have thought about that Getrag, would be so awesome to just try the difference. Looking forward to your next posts about N1 hood and a review. Always looking forward for updates on your blog. There is always things to do on a car like these. Congrats Aki this is one expensive mod! Just wondering why you did it? Was your old transmission on its last legs? This is about the only mod missing from my BCNR33, but given its costs around €10000 to do in Europe, i could never justify the cost of it. If my trans ever brakes, which is a possibility with 650hp. Then i will have to take the cheap route and upgrade to a OS-Giken 1-3 Crossmission kit. I am still getting used to the gearing, hopefully the 6th gear issue won't be an issue once I get used to it. Thanks again! Thanks Johnny! The N1 bonnet post won't be as exciting though lol..
That is sooooo nice Aki. It's actually a mod I consider too. My gearbox is still good I would say, though it shows it's age. But not having problem with getting gears in (Yet). But I do match rev to be sure it smoother when changing. 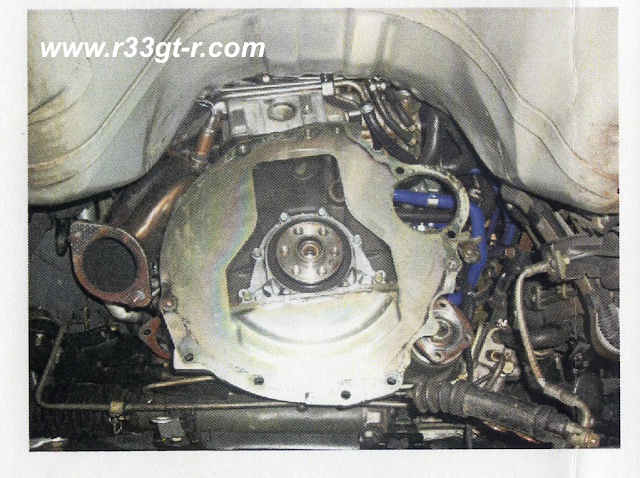 I recently drove a BNR34 and experienced the Getrag gearbox for the first time and loved it! LOL Ibo - love how you got so excited. Well I say keep your Series 3 gearbox as long as you can... Mine, every time we changed the fluid we'd see these small metal bits come out. Not to say I'm a bad driver, but watching some old videos right after I got the car it was already shifting a bit weird so I will take this chance to fully blame the original owner! It will be interesting to see how the gearbox loosens up. 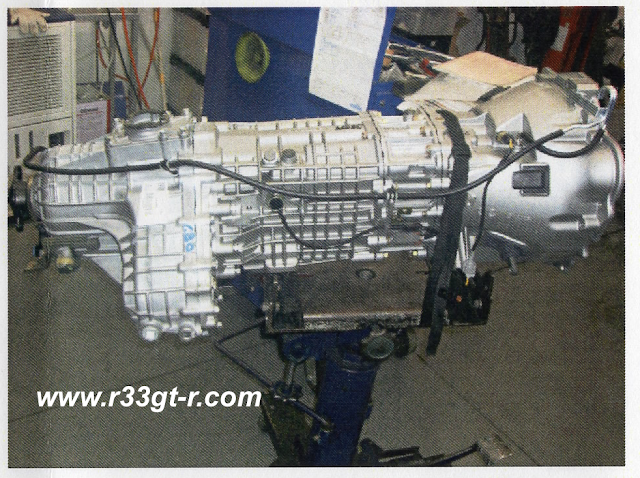 When I drove that 20,000km BNR34 (see my earlier post for April 11, 2015) the transmission did not feel like the one in my car. 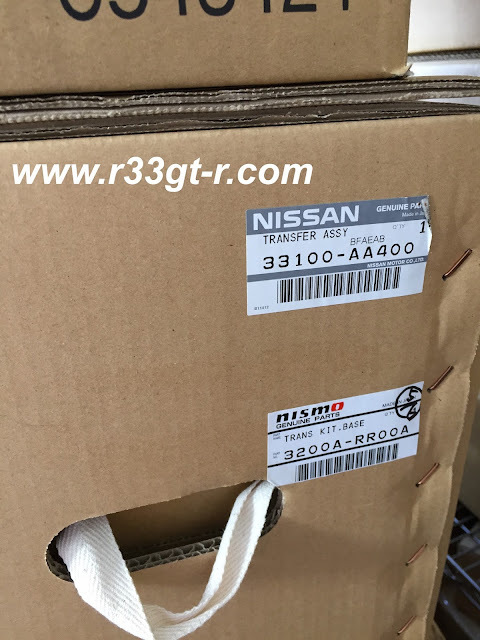 Excited,and we're going to install Nismo Getrag conversion kits as next week. 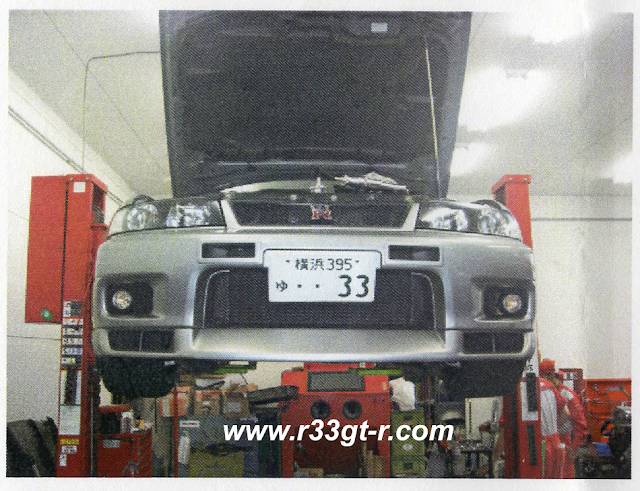 I have not decide whether to chang the front and rear transfer is 3.5 (from R34 GTR).I hope that maybe you will have suggestion.Thank you. Well done Aki and believe me having had mine for the past 1 year it really makes the car feel much more drivable and the gearing is much better for both street and track. On the 5 speed box the rev drop between 1st and 2nd is a little too much and 3rd gear which takes you up to 200kph is a little crazy for everyday driving. Did you use the Nismo 75/140 oil in the diff? Lots of discussion about what oils to use with these as they are sensitive to what you use. Most seem to go for Toyota type IV including myself on advice from Getrag Germany. Avoid redline at all costs too many Getrags have suffered bushing failure due to additives causing swelling. Prince, Frans - so sorry I just saw these comments! Many thanks for taking the time to leave them. 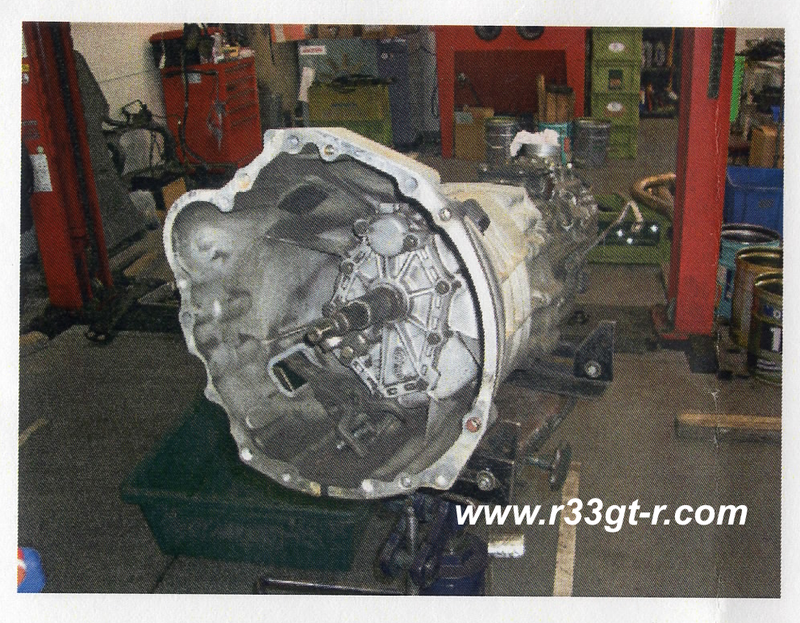 Prince, I am sorry but I have no opinion - but if you DO use the front and rear transfer from the BNR34, then you will in effect simply have the same transmission as the BNR34. Very easy to use but not as sporting because the engine will not be in the sweet spot as it is now. However it will be near OEM in driving I think. Frans, thanks for your thoughts. I have no idea which oil they used but suspect NISMO as you say. That would be for the transmission and the transfer. As for my rear diff, I have an aftermarket diff from OS Giken and use their oil, which is 80W-250 grade. Holy moley, Nismo is rather proud of that conversion judging by the list price, LOL. Is there anything in that kit that you couldn't get from a wrecked or part-out R34? 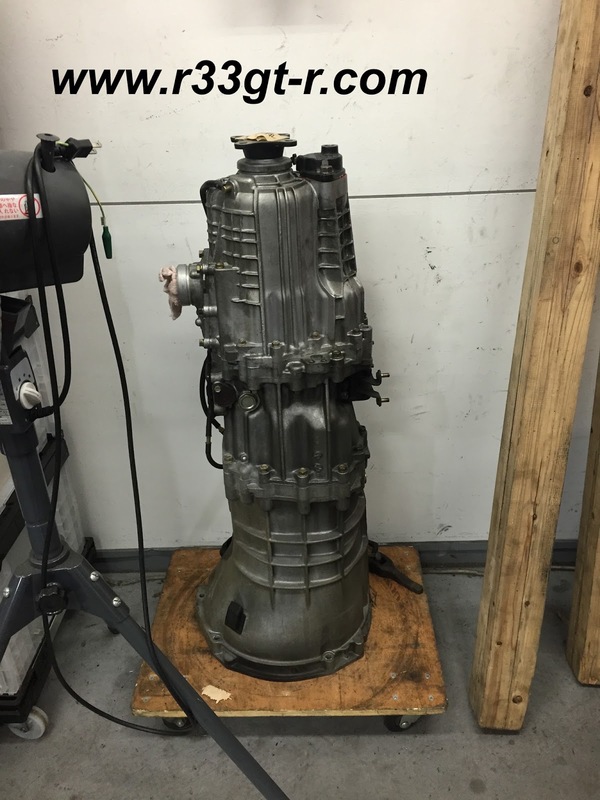 Or are you paying the premium for factory-new gearbox and t-case? For comparison I think Subaru lists the STi 6-speed at something like $6k for a new one but you can usually find them from a part-out for half that. Yep, certainly not a cheap upgrade. But if you've read through my blog, you would notice that most of my upgrades are carefully thought out, without much consideration of price - I simply like having the best. I think this is what will in the end separate my car from other modified 33s. Having experienced what gets sold second hand (I've been burned on wheels and other items), I wasn't about to take any chances with something that was gong to be expensive even if used or parted out. The way I look at it, it's cheaper in the long run to go with brand new in this case. Just like when I rebuilt my engine, I didn't use any used parts either - a false economy I think.